What adorable doe-eyed creature do we have here? 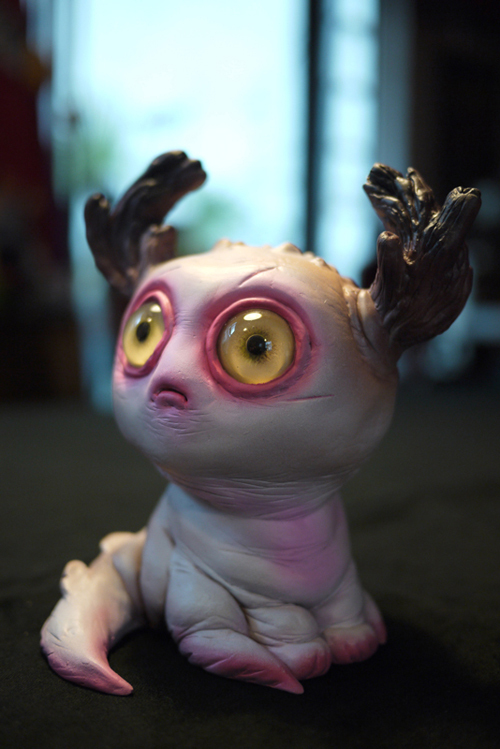 Apparently, it is a cute antlered critter from the likes of Circus Posterus artist Stan Manoukian for the Bewitching III group show! Continuing with Bewitching’s Halloweeney theme, Stan has made a splendid creature of the night for all the trick or treaters out there. Stan also went creepy with another awesome sculpt. It looks like this fella is having a parasite problem, but lucky for him, they are happy smiling parasites. He doesn’t look too alarmed, but it looks like Stan caught him off guard while taking this picture with his favorite pumpkin for Bewitching!